This originates from a pretty well known restaurant in Chico (CA). They make bomb Bloody Mary's. I used to be a drinker. Not anymore. BUT I will actually drink this without the vodka added and it's so yummy! -Combine all in a large plastic pitcher & mix well. -Best if it sits in the fridge at least overnight before serving. -Can be kept in the fridge up to 1 month. Just shake before each use. Stir or shake, garnish & serve. Tuesday - Chicken Divan (chicken & broccoli casserole w/lemon cream sauce topped w/cheese) & Steamed White Rice. Wednesday - Poor Mans Stroganoff, Egg Noodles, Steamed White Rice, Sour Cream & Mixed Veggies. Thursday - Cheesy Potato Casserole aka:Funeral Potatoes (1 w/ham & 1 without) & Green Salad. Monday (not chapter) - Cheese Quesadillas, Sour Cream, Guacamole & Black Beans. Tuesday - Swiss Steak, Garlic Mashed Potatoes & Veggies. Wednesday - Salmon, Steamed Rice & Green Beans. Thursday - Shepards Pie & Salad. Super simple, super fast & super yummy. These hit the spot when a cheesecake craving arises. They are also the perfect little gift to take a friend or neighbor who might need cheering up. -Place cupcake liners into muffin tins. -Put 1 Nilla wafer into each cupcake liner with the flat side down. -Mix together cream cheese, eggs, sugar, vanilla & lemon juice. -Mix in chocolate chips if using. -Spoon filling over Nilla wafers, filling the cupcake liners each 3/4 full. -Tap cupcake tins on the counter a bit to get rid of air bubbles. -Place both pans on the same oven shelf if possible. -While cheesecakes are still warm spoon pie filling (if using) over the top of each one. -If using whipped cream or fresh fruit then wait till cooled. -Place cheesecakes on a tray & chill in the fridge till service. 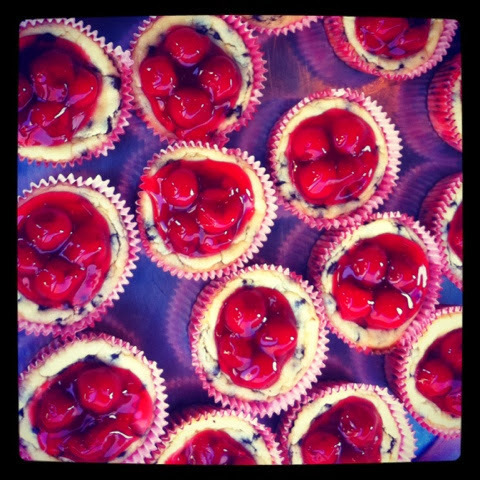 This picture is of mini cheesecakes that include mini chocolate chips & cherry pie filling on top. Monday (Chapter) - Chicken Satay Skewers, Thai Peanut Sauce, Roasted Broccoli & Steamed Rice. Tuesday - Roasted Pork Tenderloin, Garlic Mashed Potatoes & Cinnamon Apples. Wednesday - (BFD) Waffles, Blueberry Compote, Bacon & Scrambled Eggs. Thursday - Chicken Wings (Buffalo or Honey BBQ), Celery, Blue Cheese Dressing, Ranch Dressing, Cheesy Fries & Salad.